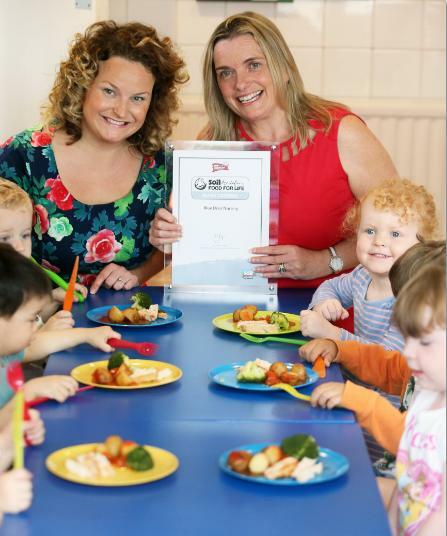 Blue Door Nursery in Cardiff has been given a Silver Catering Mark award by the Soil Association. It is the first independent nursery in Wales to receive this prestigious award which recognises the provision of healthy, sustainable food. Justine opened Blue Door Nursery in 2006. The setting provides home-cooked meals to all the children as part of their daily routine. The nursery prides itself in reinforcing good table manners and giving siblings the opportunity to play and eat together. Staff encourage the children to experience a variety of exciting tastes and flavours that are both nutritious and appealing. The motivation to apply for this prestigious Soil Association award was first and foremost a personal one. Justine explains: “When my daughter was at nursery she was well taken care of but I felt that the meals she received weren’t always conducive to her cognitive and physical development. Blue Door Nursery had to undergo a series of thorough and rigorous checks in order to be awarded with a Catering Mark. They had to demonstrate that they purchase good quality ingredients and that they cook from scratch on a daily basis. Justine says: “Every mouthful the children eat is thought and cared about. I think the award demonstrates that. Rich Watts, Senior Catering Mark Manager for the Soil Association, said: “Behind a blue door in Wales we were incredibly privileged to work with a nursery so keen to be pioneers in early years food in the country. “From the moment the Catering Mark team first encountered Justine we were impressed with her passion for providing the children in her care with fresh, sustainable food that’s nutritious too. A Silver Catering Mark wasn’t the only positive outcome for Blue Door Nursery. In the process of applying for the award, Justine approached Tesco with a query on the origin of some of their foods and their labelling. As a result, she and the children have been invited by Tesco to visit one of their suppliers in mid-August, an apple farm in Hay on Wye.